The General Administration of Sport of China has pledged to build Sanya as a winter base camp for Chinese sailboats, as more and more world-class sports events are held in the city. 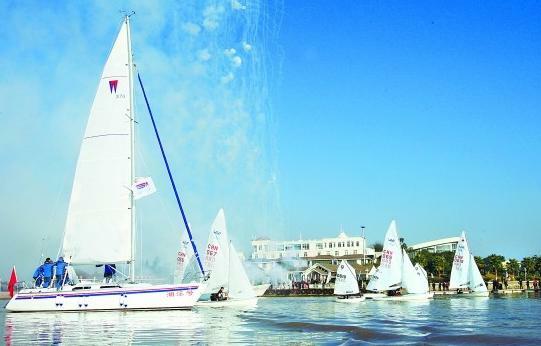 "Aloha Cup” 2012 Tour of Hainan International Regatta (THIR) is being held in Hainan from 9th to 19th March, with the starting point and the finishing point in Sanya. It’s a big chance for Sanya to step closer to becoming the winter base camp for Chinese sailboats. With beautiful beaches and pleasant climate, Hainan is the ideal place for water sports. And the newly-constructed Sanya Luhuitou Peninsula Yacht Dock is the only international level yacht dock in Hainan. According to the CEO of the Sanya Luhuitou Peninsula Yacht Dock, it has 320 standard berths with enough port depth for all types of sailboats and yachts. Besides the top-class facilities, Sanya is also paying attention to popularizing yachting sports. The organizing committee organized training and experience activities for sailboats during the “Aloha Cup” 2012 THIR time, with ages ranged from 5 years old to 60 years old. According to the director general of the Sanya Culture and Sports Bureau, the America’s Cup, one of the oldest sports events in the world, is likely to land in Sanya in October or November this year. "Sanya is bidding for the America’s Cup. The chairman of the organizing committee of the America’s Cup visited Sanya last year, and he showed keen interest to Sanya. I hope Sanya will become one stop for the America’s Cup,” said the director general.